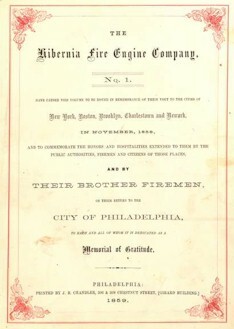 In November 1858, the firemen of Hibernia fire engine company no. 1 of Philadelphia went on tour of New York, Boston, Brooklyn, Charlestown and Newark with their state of the art equipment and a desire to bring the knowledge of this state of the art technology to their fellow fire fighters along the East Coast. 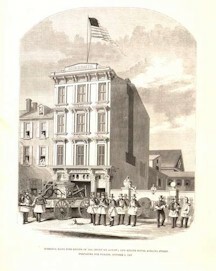 Upon their return they created a commemorative volume filled with a history of the company, illustrations of the current members, and recounting the experiences and equipment of the trip; this has now been digitized as part of the Pennsylvaniana Collection. 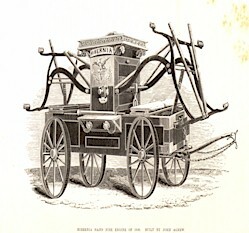 Notable among the early members of the Hibernia fire engine company No. 1 was John Barry, listed, according to the commemorative volume, on the membership rolls for 1785. Barry was the celebrated Irish naval officer and the first Commodore in the American navy who lived in Philadelphia after the Revolutionary War until his death in September 1803. Few print copies of the commemorative volume have survived the vagaries of time but now this rare peek at the daily lives of Americans from 1859 is available to all. One of the first titles scanned and made available in the Digital Library, added September 8, 2006, this title has also just been scanned (August 2008), by the Internet Archive. The future progression of technology and the advancement of new and superior file formats makes it difficult to be certain that any particular copy of a file will be migrated to the new, usable, and likely superior contemporary format. As few print copies of this work have survived to 2009, making multiple digital copies of works helps ensure the enjoyment of future generations of readers and researchers.